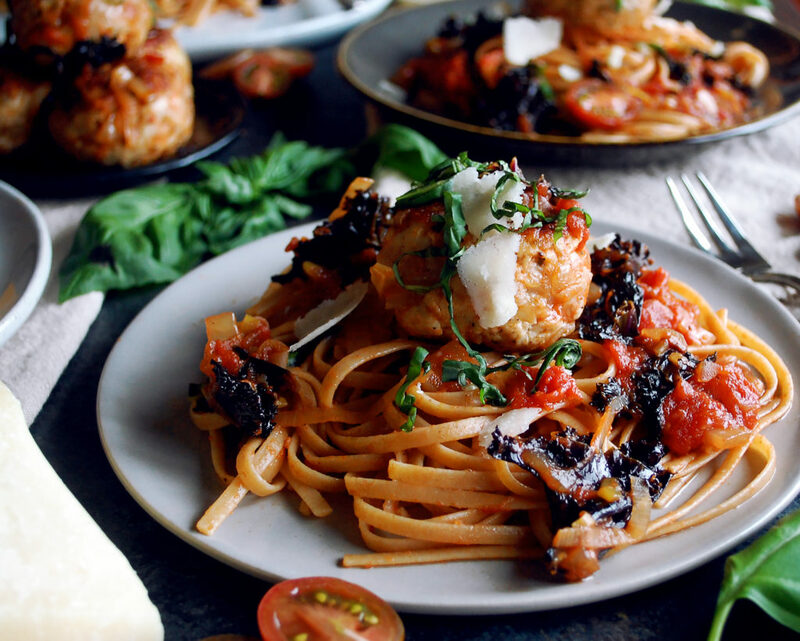 Turkey meatballs + whole grain pasta is the perfect thing to make when you want a dinner that’s healthy, but also cozy and comforting. 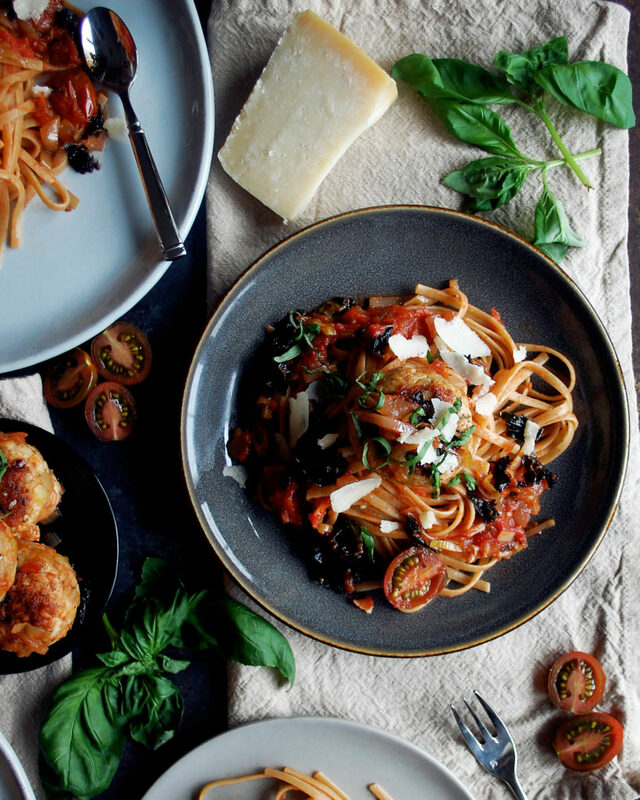 I absolutely love a classic plate of spaghetti and meatballs. When it’s done right, it can be so satisfying. I mean, all pasta dishes are really satisfying. But there’s something about the meatballs that add a nostalgic element to the meal. Sometimes, though, we crave it a bit more done up. 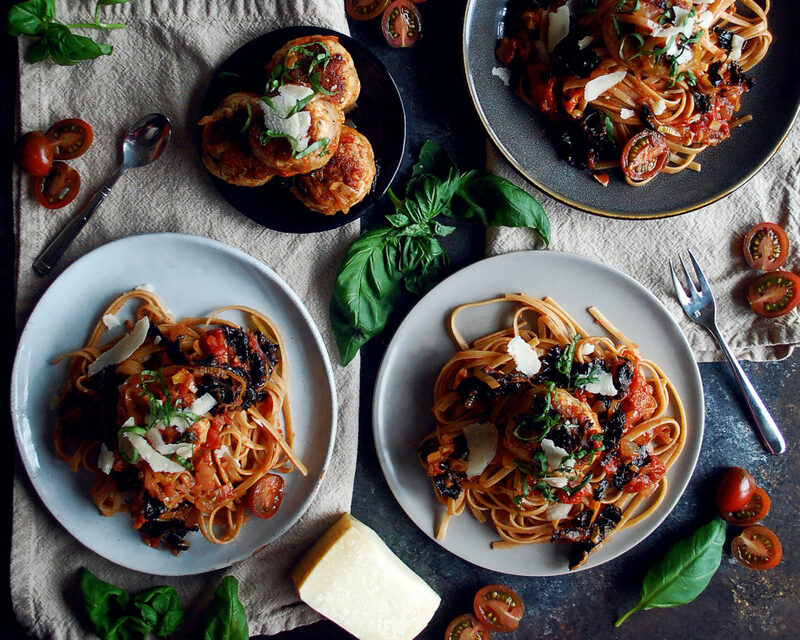 I’ve added modern day healthy twists and some extra ingredients to turn the big ole plate of spaghetti into a dish that’s a little bit more refined. 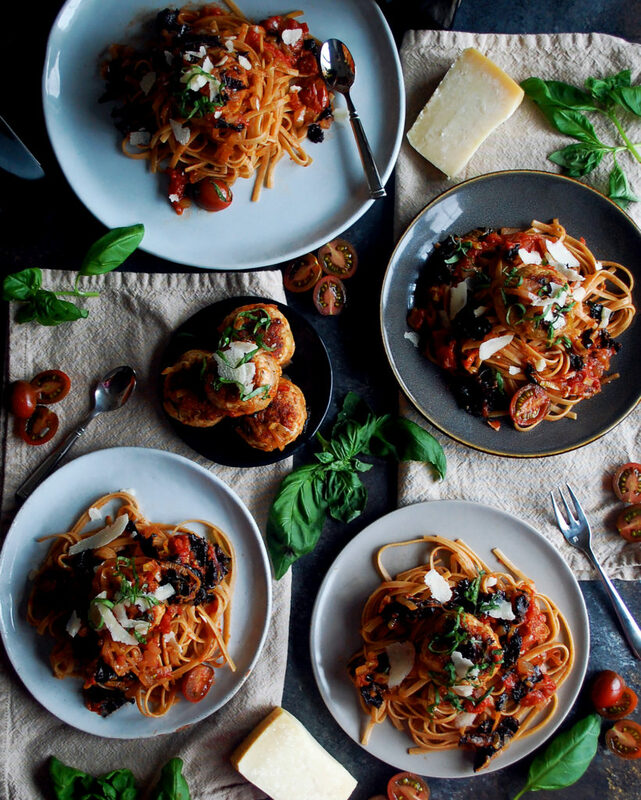 Healthy pastas are one of my go-to weeknight meals. It’s so simple to just boil some whole grain pasta, sear a chicken breast, and sauté some veggies on the side for a quick dinner. Since I do that so often, I decided to treat myself with something more extravagant, but still just as easy to make. 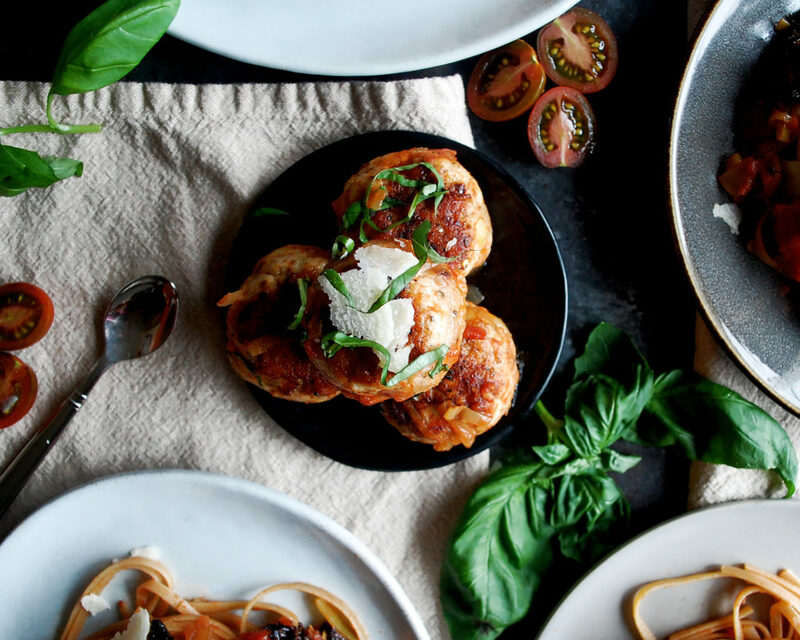 I also created this dish with Valentine’s day in mind…if you cut the recipe in half, it’s the perfect healthy date-night dinner for two, so you and your special someone can enjoy a delicious meal while feeling amazing afterwards. But, if you’re in the mood for dessert and MORE pasta, you can follow it up with my Dark Chocolate Ravioli. Back to the dish. It’s a super simple tomato sauce that gets simmered until thickened. While the sauce does its thing on the stove, I mix the ground turkey with sautéed onion, garlic, and spices, and roll out the meatballs. The ground turkey provides a different texture than your usual ground beef or pork, but it’s leaner and still stays moist. The key is to not overcook it. I sear the meatballs quickly just until they turn golden brown, and then I remove them from the skillet (it’s ok for them to be underdone at this point). Once the veggies get cooked and the sauce gets added, I return the meatballs to the pan to gently finish cooking, keeping all the moisture inside. A quick toss with some whole grain linguine and you’re good to go. I would definitely recommend to start eating more whole grain pastas. I still love and eat regular pasta on occasion, but on a weekly basis, whole grain is much more nutritious for you. It has a nutty taste and a strong bite, which I’ve grown to really like. Other than that, you just want lots of freshly grated parmesan cheese inside the pasta as well as thick shaves on top. 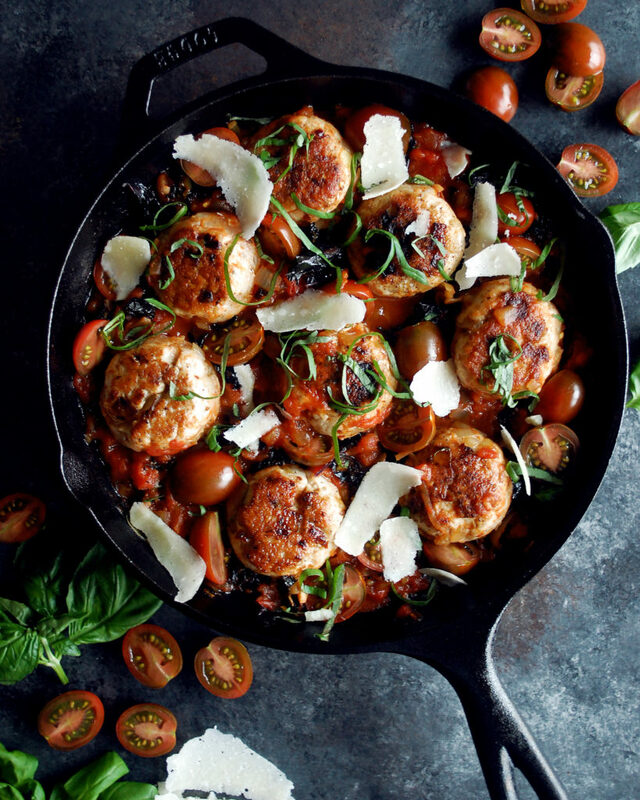 Some fresh basil, and maybe a glass of red wine, and you’ve got yourself quite the treat. Enjoy! Coat the bottom of a pot with olive oil and heat over medium heat. Add the onions and sauté until golden brown, stirring often. Meanwhile, pulse the tomatoes in a food processor until chunky. Add the garlic to the pot and cook for a minute. Pour in the tomatoes and add the red pepper flakes. Let the sauce come to a boil and then reduce the heat to a low simmer. Cook for 30 minutes covered and then 30 minutes uncovered, stirring often. Stir in the basil at the end and season with salt and pepper to taste. Keep warm until serving. Coat a large sauté pan with olive oil and heat over medium heat. Add the onions and sauté until golden brown, stirring often. Add the garlic and cook for a minute. Season with salt and pepper. Let the mixture cool. In a mixing bowl, combine the ground turkey, onion mixture, red pepper flakes, dried oregano, anise seed, salt and black pepper. Mix until incorporated. Form the ground turkey mixture into 8 meatballs. Season with a little more salt and pepper. Coat a large skillet with canola oil. Sear the meatballs on each side until golden brown. Transfer the meatballs to a plate. To the meatball pan, add the leeks, along with a little more olive oil if needed. Sauté for 5 minutes. Add the red kale and kumato tomatoes. Season with salt and pepper. Cook until the kale is wilted and the tomatoes have softened. 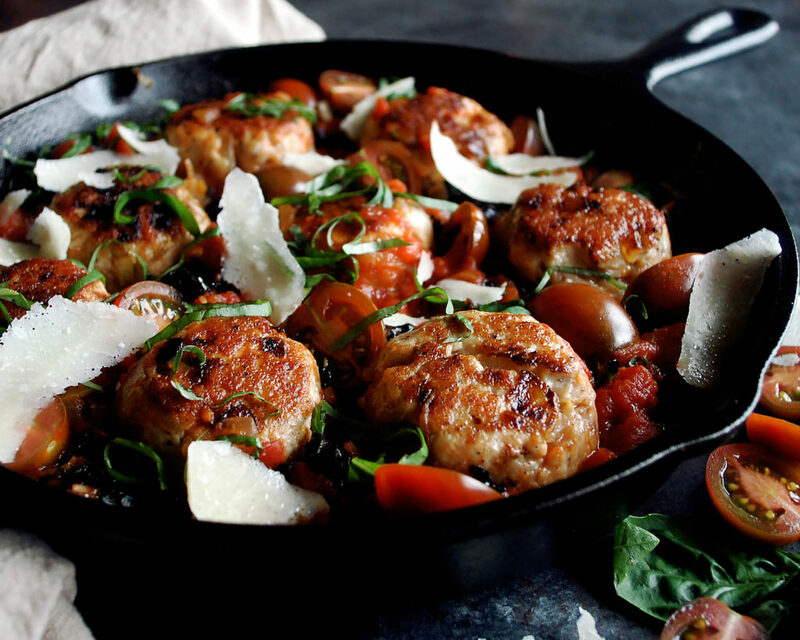 Add the tomato basil sauce to the pan, along with the seared meatballs. Simmer until the meatballs have finished cooking through. Stir in the pasta and freshly grate lots of parmesan cheese into the skillet. Stir to coat. 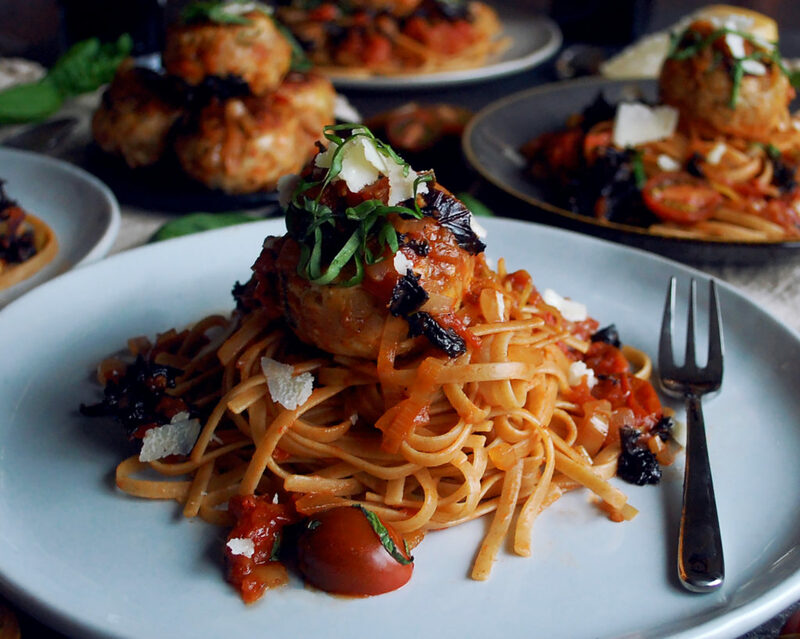 Serve the pasta with the meatballs on top and a spoonful of sauce over everything. Use a peeler to shave thick pieces of parmesan as a garnish. Finish with a sprinkling of basil. I usually make a double or triple batch of the sauce so I can use it in other meals during the week. If you don’t get through it all, you can freeze it for the next time you want some homemade tomato sauce.